Background: The human aldehyde dehydrogenase 2 (ALDH2) is the most effective enzyme in the detoxification of alcohol metabolite acetaldehyde. The ALDH2*2 mutation is caused by a single nucleotide substitution which results in a nearly inactive form of ALDH2 enzyme. The ALDH2 genotype has been used as a surrogate of alcohol to get causal inferences of alcohol in related diseases implementing Mendelian randomization approach. In addition, ALDH2 enzyme has significant effect on different diseases, indicating the potential therapeutic value of ALDH2 regulators including both activators like Alda-1 and inhibitors such as daidzin and daidzein. Objective: In this review, we aim to systematically discuss the implications of ALDH2 genotype and ALDH2 enzyme regulators, highlighting their epidemiological and clinical importance, respectively. 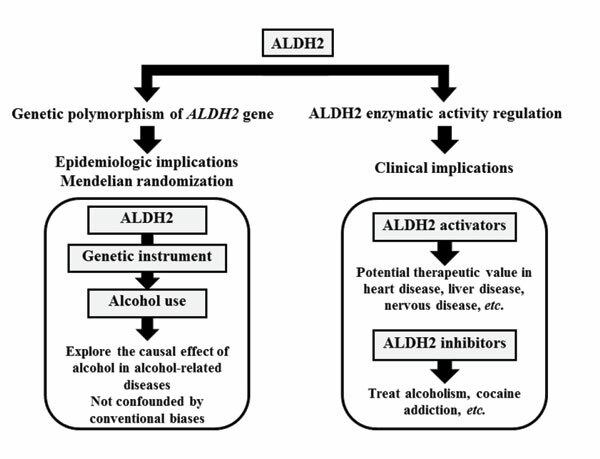 Conclusion: ALDH2 polymorphism is shown to be a genetic instrument for alcohol use in Mendelian randomization analysis. ALDH2 regulators exhibit potential therapeutic value as the important roles of ALDH2 in various diseases. Both the genetic polymorphism and enzyme activity regulation of ALDH2 are of great importance to their epidemiologic and clinical applications. Keywords: Aldehyde dehydrogenase 2 (ALDH2), ALDH2 activator, ALDH2 inhibitor, genetic polymorphism, Mendelian randomization, observational epidemiology. Keywords:Aldehyde dehydrogenase 2 (ALDH2), ALDH2 activator, ALDH2 inhibitor, genetic polymorphism, Mendelian randomization, observational epidemiology. Abstract:Background: The human aldehyde dehydrogenase 2 (ALDH2) is the most effective enzyme in the detoxification of alcohol metabolite acetaldehyde. The ALDH2*2 mutation is caused by a single nucleotide substitution which results in a nearly inactive form of ALDH2 enzyme. The ALDH2 genotype has been used as a surrogate of alcohol to get causal inferences of alcohol in related diseases implementing Mendelian randomization approach. In addition, ALDH2 enzyme has significant effect on different diseases, indicating the potential therapeutic value of ALDH2 regulators including both activators like Alda-1 and inhibitors such as daidzin and daidzein.